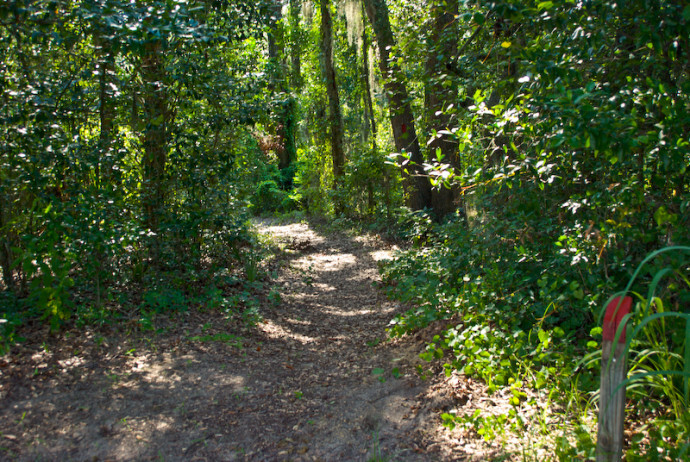 Hidden Waters Preserve | Florida Hikes! From an aerial view, it’s obvious the region around Eustis and Mount Dora is pockmarked with sinkholes. 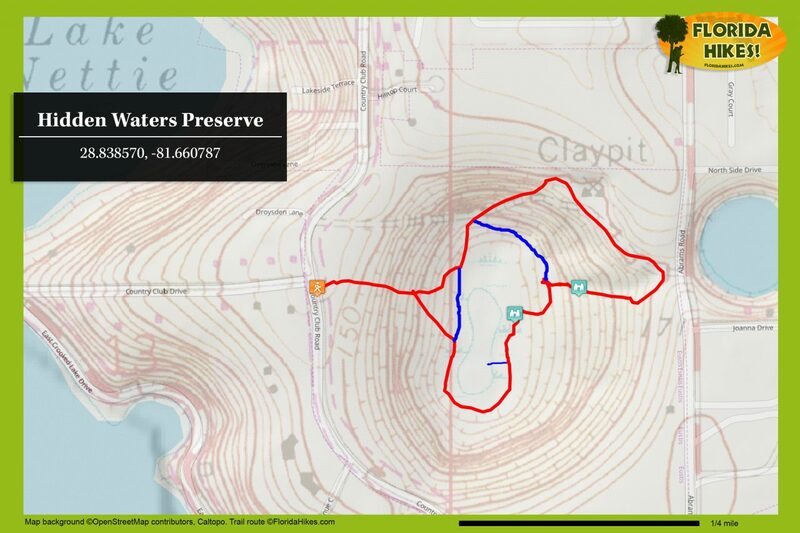 Hidden Waters Preserve is managed by the Lake County Water Authority to protect and utilize a massive sinkhole— the Eichelberger Sink. When you’re descending into it along the Lake Alfred Trail, the slope is especially steep. The Ravine Trail leads up and around a deeply eroded gash in the landscape caused by funneling water down into the sinkhole from the hillside above. It’s a study in how geology shapes habitat, and an excellent spot for birding … and for getting a workout during your hike! No dogs or bicycles allowed. The trails are narrow and somewhat overgrown on the east side of the ravine, so be cautious of poison ivy. Not all trails are well marked. The blue blazes keep you on the Lake Alfred Trail, which rings the lake inside the sink, and the red blazes are for the Ravine Trail. 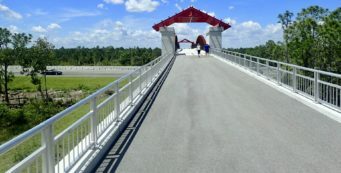 A separate entrance on the opposite side of the property enables easy access to a half-mile walk in the sun on the grassy upper slope. From US 441 just south of Eustis, turn north on Donnelly Road (CR 44B). Turn at the first left, Waycross Road. Follow it until it ends; turn right onto Country Club Road. After it swings through the hollow created by the sinkhole, watch for the grassy parking lot and trail kiosk on the right. Your hike starts at the kiosk. Be sure to sign in. 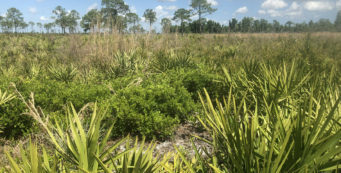 This is the start of the blue-blazed Lake Alfred Trail, which immediately begins its descent to the “lake” within Eichelberger Sink, passing through a restoration area where longleaf pines are filling in nicely. 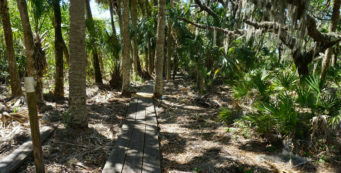 As you reach the hardwood hammock, which is dominated by laurel oaks, take the left fork to follow the trail as it plunges downhill to the vast open marshy area at the bottom of the sink, Lake Alfred. You reach a junction with a mowed trail (the Lake Alfred Loop) at 0.2 mile. Turn left to walk past the willow marsh, after which the trail starts making an ascent. Entering the shade of the forest, you climb uphill to a trail junction, meeting up with the Ravine Trail. The Lake Alfred Loop turns right, but you should continue straight, headed up a relatively steep slope along the Ravine Trail. The trail narrows, and vegetation crowds in from both sides. 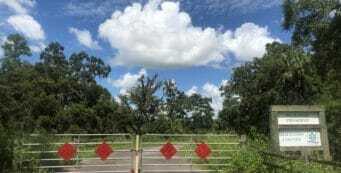 It makes a jog to the right and emerges at the edge of a grassy meadow, a former pasture, reaching a T intersection with a loop that encompasses the entire open pasture. Turn right. The Ravine Trail continues along the edge of the forest and skirts around what used to be the natural flow of water from beneath the clay into the sink, now excavated and managed as a stormwater pond. The additional flow created by managing the water has caused some serious downslope erosion, as you’ll soon see. After 0.5 mile, you reach the junction where the Ravine Trail heads back downhill. Turn right and head into the deeply shaded forest. After a short distance, you’ll start hearing the sound of burbling water, and will notice the deep gash in the landscape through the trees on the right. There are several overlooks as the trail begins to sharply descend, paralleling the waterway. Elephant ears and netted chain fern thrive in the humid ravine. On a clear day, water trickles down through the ravine. I wouldn’t be surprised if it thunders through during a rainstorm. At the bottom of the ravine, there is now a bridge, and a trail junction with the Lake Alfred Trail coming in across the bridge from the left. Turn left to take the Lake Alfred Trail around the marsh. Descending through the laurel oak forest, you parallel the stream, which is now a surface flow, gurgling and bubbling as it drops over the roots of trees. It meanders off into the willow marsh as the trail jogs left, then right, to emerge at the edge of the marsh. It’s now a mowed path along the edge of Lake Alfred, again at the bottom of the sink. Dayflowers bloom in profusion in summer. The trail reaches an intersection at 0.8 mile. Turn left. If you head straight upslope, the broad trail ends up at the back entrance of the preserve. Instead, turn right at the lilac-blazed post. This short jog through the forest keeps you in the cool shade while passing through a thicket of American beautyberry, sporting tiny pink blooms in summer. Dropping back down, it returns you to the edge of the marsh at a T intersection. Turn left. After 0.9 mile, you reach another trail junction on the left, the exit trail for the Lake Alfred Loop. Turn left and start climbing the slope. Across a field of prickly pear cactus, resplendent in large yellow flowers in the heat of summer, you get your last glimpse of Lake Alfred across the willow marsh before ascending out of the sink, passing the intersection where you first headed downhill. The trail rises up into the young pine forest and ends at the kiosk after a mile.